Alright another fun recipe with more pumpkin to share. I recently shared another pumpkin recipe, due to the fact my dear husband bought so much pumpkin puree that I found hanging in one of our cupboards. Growing up as a little kid my parents did not have a whole lot of money so my mom always taught me never let anything go to waste. It has been imbedded in my head for years, and so whenever I see something that needs to be used I think of some kind of quick recipe. 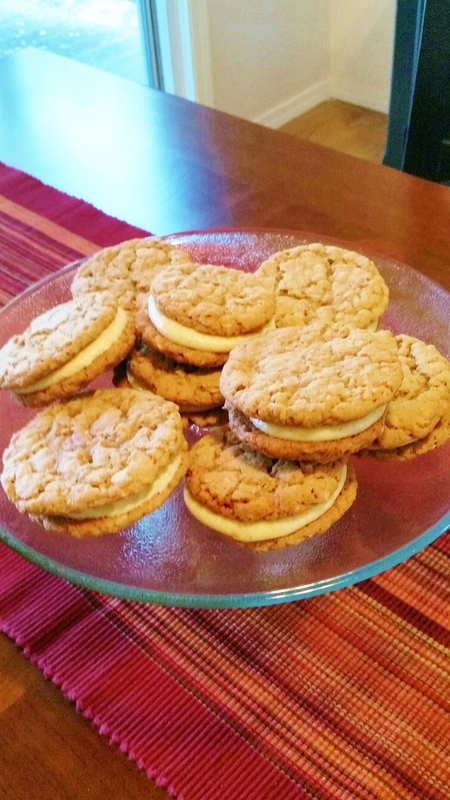 Oatmeal Cookie pumpkin cream cheese whoopie pies are so addictive I could not help myself I had to eat more then one while baking talk about sugar rush. The sandwhich was just so comforting to me brought me back to childhood when my mom would always bake around the Fall time. Love love love that time of the year and I just can not wait for it to get here any sooner. I have to say I am not a big fan of oatmeal cookies, but this recipe changed that for me I finally found a recipe to die for, chewy and filled with the spice of pumpkin pie. you got to try this and really it does not take that long to make. Using a handheld or stand mixer fitted with a paddle attachment, beat the softened butter and sugars together on medium-high speed until smooth. Add the egg and vanilla and mix well. Scrape down the sides and bottom of the bowl as needed. In a separate bowl, whisk the baking soda, cinnamon, oats, and flour. Add the dry ingredients to the wet ingredients, then mix together until just combined. Do not over mix. Chill the dough for at least one hour (and up to 1 day) in the refrigerator. Cookies will be very flat if the dough is not cold– so don’t skip this step. Preheat oven to 325°F (163°C). Line a cookie sheet with parchment paper or a silicone baking mat. Roll 2 teaspoons of dough into a ball and place onto prepared sheet. Bake for 12 to 14 minutes and let cool on cookie sheet for a minute or two before transferring to a wire rack. While the cookies are cooling, prepare the pumpkin frosting. Using a handheld or stand mixer fitted with a paddle or whisk attachment, beat the cream cheese, butter, pumpkin, and spices on medium speed until creamy. Add 2 – 2 and 1/2 cups of sifted confectioners sugar depending how sweet you’d like it. If frosting is much too thin, add in the flour to thicken it. Spread a generous amount of frosting on the underside of a cooled cookie and sandwich another cookie on top. Cookies stay fresh for up to 5 days in an airtight container in the refrigerator.